Promoting Blog Posts is really important, that's why your blog post will reach to audience, there are many ways to promote your blog post, like social medias (Google Plus, Facebook, Pinterest, Twitter), Email marketing. All these promoting blog post tactics come under inbound and outbound promoting. But, if we will talk about promoting blog posts like non stop monster then its sound some thing different, right! so here in this blog post, I am going to share with you, how can you promote your blog posts like non stop monster. Probably you know about basics of SEO, right there is a term in SEO that is anchor text, if you can write anchor text better way on your blog posts, then it will help your readers to know all concepts about the blog post, it is also good for your blog SEO health, see there are many benefits of using anchor text on your blog, these two are main benefits. Now lets know this fact in details, I am writing this blog right! But you are reading this blog post, till now have read about 150 words of this blog post and you have also seen that many text have link, which has been link to my old blog post, that means I am promoting my old post in this blog post for free more page views of my blog and see it is beneficial for you too. To know the concept of any typical terms, it is also good for search engine optimization point of view. And it is also helping to increase the page views of my blog, you can also use the same method to improve your blog readers experience, if you are not linking to the blog post then probably your blog readers will search some where else. So to make it clear, just link your old blog post to the new blog post and see your alexa rank will improve within a week, do one more thing do not link your blog posts to the same keyword every time, just link with little variations of keywords like. If you want to link to SEO then use terms like basics of SEO, SEO factors this is good for increasing reputation of your blog. One another tactic I would like to share with you, you do comments on other blogs to get visitors, okay. But have you ever comment on any other blogs to get visitor to the single blog post or probably to your pillar blog posts, I don't know you did it or not. I do know one thing it will help you a lot to promote your blog post and finally your blog, so how can you do it. Just add there your blog post URL(Universal Resource Locator) instead your blog URL, that's it. It's not like commentLuv this is totally different, but useful for you to take your blog to the next level. There are many ways to make your own network online like creating your own group of WhatsApp, Facebook Group, Page as well as e-mail, which I have also described but all depend on things you are sharing on your blog. But, again you need to give your best to make an effective network, which will work, I mean which will drive you lot of traffic. Hard work always work does not matter in which field you are working right now, people said do smart work. But, I said do hard work, because only hard work can help you to do smart work later. Another thing is that how would you make your content to reach to right people means those are looking for information what you are providing in your blog? Its simple find out resources to know your readers, you can use survey form on your blog to know more about this. E-mail marketing is the key, let me tell you about one of the blogger he is John Chow he said that he did only one big mistakes in blogging that is e-mail marketing, he did not make a list of people those were reading his blog. And he did later from this he made lot of money, you must use e-mail marketing to make your own huge list. You can also promote your blog offline, but you need to promote after looking at your blog, if you have a jobs sites or helpful sites then you can put your poster near to college as well as near to book shop where students hang out. But, it would be different for different niche blogs, this is one of the best way for promotion yes most of the bloggers missed this opportunity because they don't want to share with others physically what they are doing online? Even, I made the same mistake but later I realized this is also important in order to get local customers, which will increase your revenue from blogging, just implement this it will be very profitable for you. Creating videos really helpful for getting more exposure as well as explore, getting new connections, new customers, re-marketing too. See, Youtube having lot of opportunities for bloggers, I mean you can build strong back links from Youtube videos those will drive you lots of traffic. But, for this you must have very good quality videos, as well as you need to do little bit settings on Youtube, that's why you can get free traffic. I will suggest you to create a Youtube channel and then cross promote your article on your channel as well as on your blog, in this way you can get revenue from Youtube as well as you can get good number of visitors to your blog, now a days people are moving towards videos that is the reason you also need to move on, I mean videos are much easier to promote and people really love to watch videos, even I have my own channel but there I shared about Mechanical Engineering video tutorials. See there are many ways to promote your blog, but I found these ways are unique for any newbie blogger, I will suggest you to do two things- keep blogging and testing. If you really want to make serious money online. 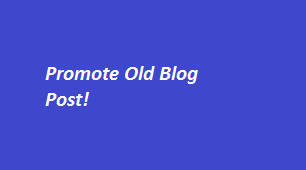 Is there any other way to promote your old blog posts?